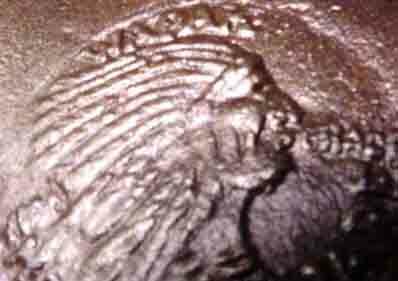 You don't see the real #4 Wapak Indian Head skillet that often, nor the TWO reproductions. However, it is easy to tell the real one from the one Reproduction. The key to identifying this one reproductions is the HANDLE. Look at the last two pix and you see the MAJOR difference. Real WAPAK Indian head skillets have a distinctly different handle. Also as you will see in the first three pictures, the casting of the reproduction skillet is not too good. However, look at the handle if you are unsure and you'll make the right decision every time. 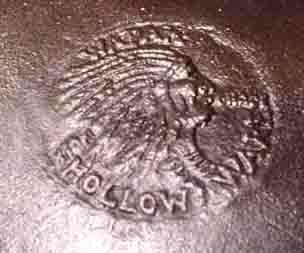 The real WAPAK Indian Head skillet handle. Now the second reproduction is not as easy to tell, especially if it is coated in cooking debris, built up carbon, etc. This reproduction has the same real handle as the correct Wapak Indian, but the cast is bad, the Indian looks really good and the weight is almost exactly the same. Here are some pictures of the second reproduction. 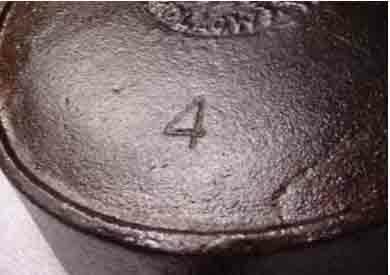 As you can see this is a new type of reproduction for this skillet and the weight is only off by 0.3 ounces. The diameter is almost exact, about 1/8 of an inch smaller on the fake/repro. The rim on the fake is a little thicker and the heat ring is also thicker. If you didn't have a real one with this one, you'd be hard pressed to know the difference, if there was caked on carbon until you cleaned it and then you'd know.